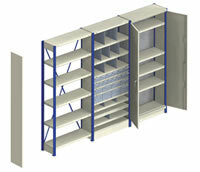 An excellent storage solution for medium and light loads. A wide range of accessories is available to increase functionality: drawers, dividers, side panels, back panels, plinths. etc. Quick and easy to assemble, excellent loading capacity and stability. Smart and attractive design which blends in with any setting.